Two Northside artists talk about their work and reflect on Handmade Arcade, Pittsburgh’s award-winning craft show, which takes place this weekend. Neither Annie Perri Cole, of Brighton Heights, nor her mother, Bridget Perri, could ever manage to keep a plant alive. “We are not plant ladies, but we admire that aesthetic,” Perri Cole says. Over the past few years, Perri Cole noticed the growing popularity of the “plant lady” persona on Instagram and wanted to help create a space for people who, like her, did not identify with it. 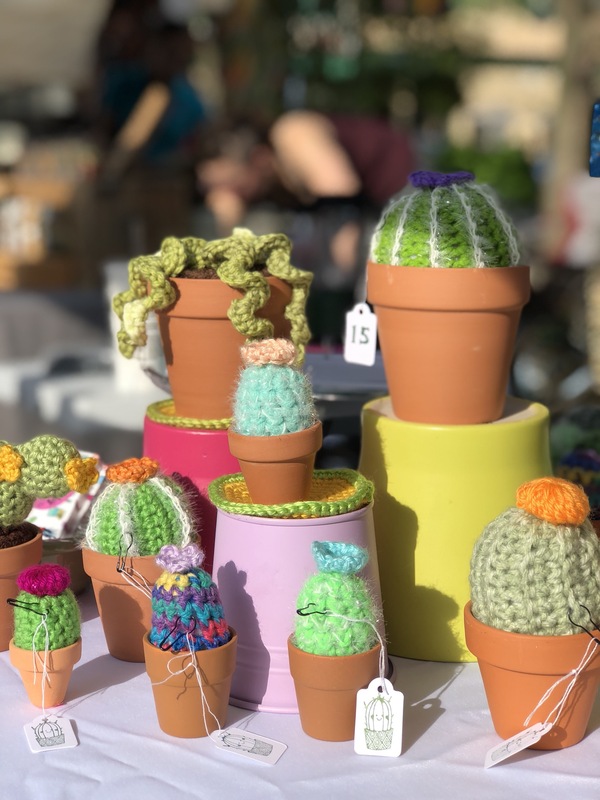 Since she and her mother both love to crochet, in 2016 they started Plant Lady Wannabe, an experiment in making crocheted cacti from acrylic yarn found mostly at yard sales. Annie Perri Cole and her mother, Bridget Perri, make crocheted cacti for people who wish they were plant people. Their business, Plant Lady Wannabe, will have a table at this year’s Handmade Arcade. Plant Lady Wannabe will join 238 other participating vendors in Pittsburgh’s Handmade Arcade on Saturday, Dec. 8, from 11 a.m. to 7 p.m. in the upper-level Hall B of the downtown David L. Lawrence Convention Center. This year, event organizers are expecting their largest one to date. Perri Cole’s cactus making process is simple. She’s in charge of crocheting the bodies of the plants, and her mother completes the “assembly line” handiwork with the flowers and dirt. 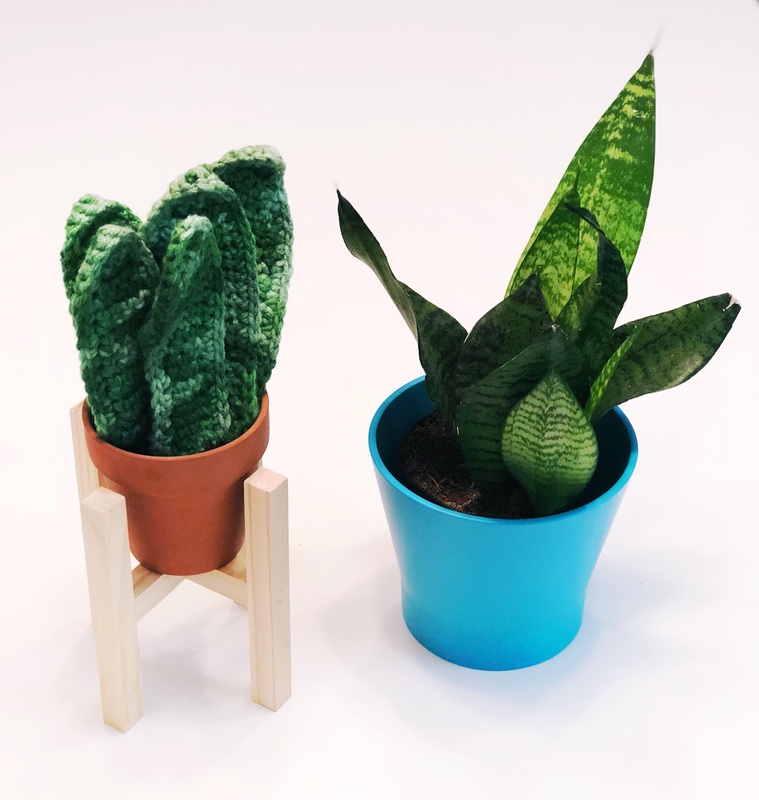 The duo’s biggest sellers are the $5 “minis,” each in a one-and-a-quarter-inch terracotta pot. They are offered in both “spiky” and “non-spiky” versions, determined by the type of yarn that’s used. The spiky versions, she says, often fool people. Perri Cole and her mother use variegated, or multicolored, yarn to replicate snake plants. In addition to crocheting cacti, Perri Cole and her mother have made string of pearls hanging plants, used variegated, or multicolored, yarn for snake plants and have put four or more cacti together, side by side in varying heights, to build “fairy castle cacti.” These specialty plants are not usually sold in stores, but will be available for sale at Handmade Arcade. It’s her second year at Handmade Arcade, and Perri Cole is eager to check out the other vendors’ booths. There’s a sense of camaraderie between vendors, she says, that makes the event stand out from other craft fairs. James Gyre and his wife, Laura, also residents of Brighton Heights, will return for their fourth Handmade Arcade this year. They started their business, Naked Geometry, about five years ago, creating art and jewelry inspired by “sacred geometry,” or the inherent mathematics of nature. Gyre began to draw geometric patterns “obsessively” after college, he says, and tried to figure out what made well-known painters like Leonardo Da Vinci and M.C. Escher so great. He discovered that they all studied geometry. “The fundamental challenge that geometry tries to solve is how space is filled evenly, intimately and elegantly,” says Gyre, who designs his pendants based on the size of materials he has to work with, to reduce waste. The “Pythagoras Tree Shadowbox” from Naked Geometry was the first non-jewelry project business owners James and Laura Gyre created. This fragrant set of ornaments is laser-cut from three-layer birch plywood. Gyre grew up in his father’s woodshop, and says he’s always been good at packing items in space. “I [once] put an entire rock band’s worth of equipment in a Jeep Cherokee,” he boasts. The bestselling Naked Geometry product is the “Old World Geometry” poster, which displays the basics of how to tile, weave knots and construct fractals. The company’s website advertises it as “all of our secrets in one poster,” and Gyre estimates that the sale of it accounts for a tenth of the business’ income. Selling art at Handmade Arcade is one way he and Laura choose to rely less on conventional retail sales and art galleries to put their work into the world. New to Handmade Arcade this year is “The Cutting Edge,” a fundraiser held the night before the event, on Friday, Dec. 7 from 5:30 to 8 p.m at the David L. Lawrence Convention Center. Funds raised will go toward keeping Handmade Arcade a free event and supporting the Handmade Arcade Youth Maker Scholarship Program, which offers a chance for young entrepreneurs, ages 16 to 18, to earn free vendor space at the event. For more information and a full list of participating vendors, visit www.handmadearcade.org.